On a family holiday to the Kimberleys, AT reader Alison Campbell Rate learns the value of walking tall, staring straight ahead . . . And lying through her teeth. I try not to lie to my children. It sets a bad example. Besides, I might get caught. But there comes a time in every mother’s life when a lie – or, indeed, several – is well and truly warranted for everybody’s good, including her own. When that moment of truth hits, you lie with ease and without compunction. I blame this moral degeneration on the barefaced lies of a chance-met acquaintance. We’d left the translucent waters of Broome about 350km behind us and were now deep in the dry, red heart of the Kimberley. 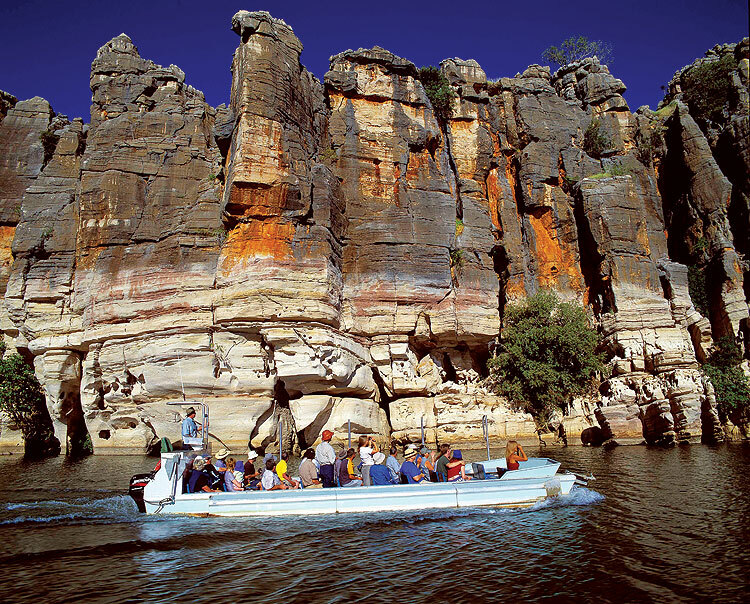 We knew Fitzroy Crossing was the place to see Geikie Gorge so we took a cruise in an open, flat-bottomed boat. The Gorge was originally a coral reef lying under a warm shallow sea. Raised, scored and shaped by nature’s antics over eons, its limestone walls are now home to busy pairs of nesting fairy martins and flashing rainbow bee-eaters. Freshwater crocs, the almost safe kind, smiled at us from their rocky islands. I relayed this information to my husband within earshot of the children. Second mistake. They were all mad keen, so there we were next morning driving along a shuddery 4WD track towards our doom. The landscape was dramatic – rocky outcrops, savannah-like stretches of grassland, high limestone escarpments above. Boabs stood among the rocks, like sentinels or guardian spirits giving both an exuberant welcome plus a stern reminder not to litter. Tunnel Creek itself is a wide passageway about 750m in length cutting through to the other side of the Napier Range and nursing year-round water. The heat and glare of the outer world penetrates for a few metres, then darkness takes over. The fun part consists of wading through this thick darkness clutching a torch, negotiating large, chilly pools up to a metre in depth. The kids, initially wildly excited, were nervous of plunging into black water. Having been reassured we were safe from freshwater crocs, I discovered far too late that the tunnel was populated with something almost as unpleasant. Back at the edge of the first pool a voice inside my head had said: “Enter and you die.” But we couldn’t back out now. Summoning up the sort of hearty parental tone required in circumstances like these, I reassured the children that there were absolutely no crocs and that there was nothing to worry about and the torches were not going to go out, well not unless you drop it in the water, Connor, and no, I can’t carry you, I’m carrying the torch; no-one has ever got lost in Tunnel Creek, James, you just go straight through to the end then turn around and come straight out again; that’s just a rock, a rock, Hannah! We were fast approaching the point at which I realised I’d been lied to. During this running monologue, calculated to shore up my courage as much as theirs, I caught sight of a long, skinny shadow swimming slowly alongside. Then another, and another – some of them quite unnecessarily big. I suppressed the need to announce to the whole of the Kimberley, “EELS!” and concentrated on swinging the torch beam aside each time one slithered into my line of vision so the kids wouldn’t see. This is where the lies began involuntarily spouting forth: Let’s just go this way where it’s not so deep; move left – there’s a big rock, you don’t want to stub your toes; oh, look at that stalactite! I could only see them when they silently entered into my little spill of torchlight, but how many were gathering in the blackness? Paul had by this time realised what was going on and the pair of us ducked and weaved, hauling children left to right. There were dozens of the creatures; my eyes were out on stalks as I tried to keep tabs on my immediate vicinity. I could only see them when they silently entered into my little spill of torchlight, but how many were gathering in the blackness? Any minute now I’d feel a pair of jaws fastening onto my ankle . . .
At last we emerged into sunlight at the far end, where I flopped on the sand and contemplated the return journey. A mother’s courage knows no bounds. Back we went, successfully dodging and lying our heads off until, just as we were nearing the end of the very last pool, Hannah caught sight of a huge specimen sliding past her leg. Before she could do more than drop her jaw in horror, I’d whisked her sideways and out onto dry land. No doubt the eels were harmless, leading a blameless life in their own little world. No doubt I overreacted. If the woman on the boat deliberately left out this nugget of information it was probably from the best of motives. After all, had I known I’d probably have refused to put one foot in the water and we’d have missed out on what was undeniably a fabulous underground adventure. Family friends went trekking north earlier this year for a couple of months and I dropped in prior to their departure with maps and notes. Funny thing, but although Tunnel Creek came up as a “must do” with their boys, I can’t recall any mention of eels. Perhaps I just forgot.